• How does your Guaranteed Financing Program Work? Never Say No Auto has a partnership with a lender that allows us to share in the risk with the financing. This allows us to offer Guaranteed Credit Approvals to everyone. This Guaranteed Financing Program reports to all major credit reporting agencies to help you establish or re-establish your credit. • How much will I need for the down payment and monthly payments? The down payment and monthly payments vary between each vehicle that you choose. We will work with you to find the best vehicle that fits your needs. How long can you finance a vehicle? The financing terms can go up to 72 months, but this varies depending on the vehicle you choose. • How long does it take to get approved for a loan? The approval process is simple, come in and pick out a vehicle and we will give you the approval terms within minutes. • Will you hold a car until I have the entire down payment? Yes, if you come in and pick out a vehicle and you need more time to get your total down payment together, with a deposit we will put together a timeline and hold that vehicle for you. • Can you finance your sales tax into the loan? Maybe, this depends on the lender that we use for financing. If you use this option it could require more money down. • What to bring with you when buying a car? • If you have a checking account, bring in your most recent Bank Statement. • Can I trade in my vehicle? Yes, we can use your trade in towards your down payment. Push, Pull or Tow. Even if you owe money on your trade. • Can I pay cash for a vehicle or do I have to finance? Yes, you can pay cash or finance. We also have partnerships with local banks and credit unions that offer very competitive financing terms with good credit. • Do I make my loan payments to Never Say No Auto? No, you will make your payments to a separate company. You will have the flexibility to make weekly, bi-weekly or monthly payments. • Can I go to my bank to get a loan? Yes, you can go to your bank. We also have partnerships with local banks and credit unions that offer very competitive financing terms with good credit. • Can I pay off my loan early? Yes, you can pay off your loan early. • How do I show income if I’m self-employed? You can pick 1 of these options. • Can I get approved if I don’t have a job? Yes, with our Guaranteed Financing program we will give you an approval. If you don’t have a way to prove income or currently have a job, the down payment will be higher. If you’re self-employed or get other sources of income we can use bank statements or cancelled checks. • Do you inspect your vehicles before you sell them? Yes, we have a very thorough process to inspect and look over every car. If we buy them at dealer auctions, we pay to have them inspected by a third party while at the auction. After we get the car, we use ASE Certified Mechanics to give the car a complete checkout and do all necessary repairs and maintenance. • Do you offer warranties? Yes, we have several different warranty options. • Where do you get your cars? We have very experienced car buyers that go to dealer auctions and we buy them from individuals. • Is the inventory on your website current? Unfortunately No, because a lot of our cars sell very quickly, we recommend coming in or calling us to see if we have what you’re looking for. 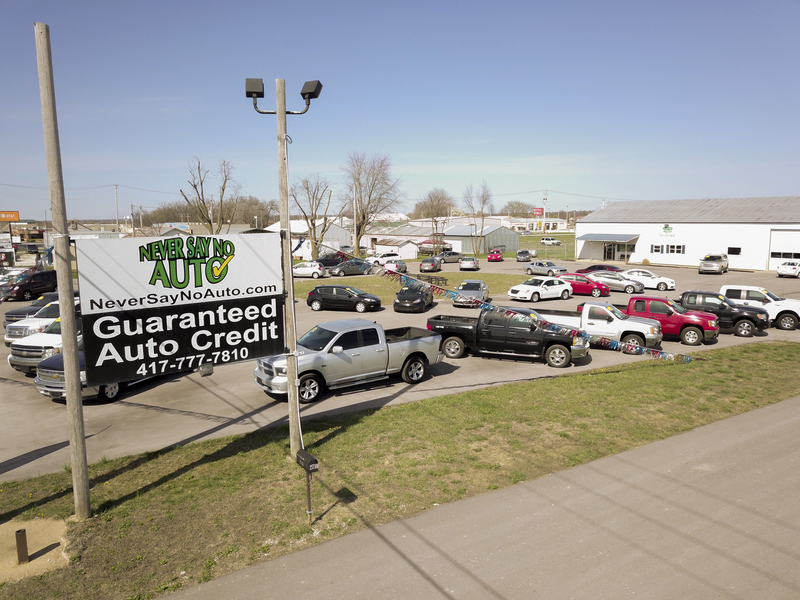 With 2 locations, we have around 200 vehicles in inventory and get around 20-25 new vehicles every week. • Do I need to have a Driver’s License to get a loan approval? No, you don’t need to have a Driver’s License with our Guaranteed Credit Approval Program. You will need to have a Photo ID. 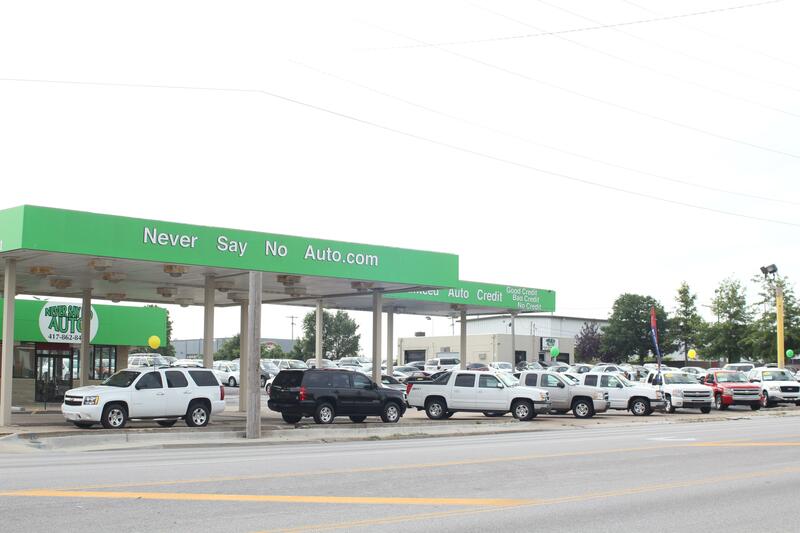 Come see us at Never Say No Auto. We have a large selection of used cars, trucks, SUV’s, & vans and we’ll help you find the one that fits your budget and requirements. All of our vehicles go through a 60 point inspection and have a clean AutoCheck history.